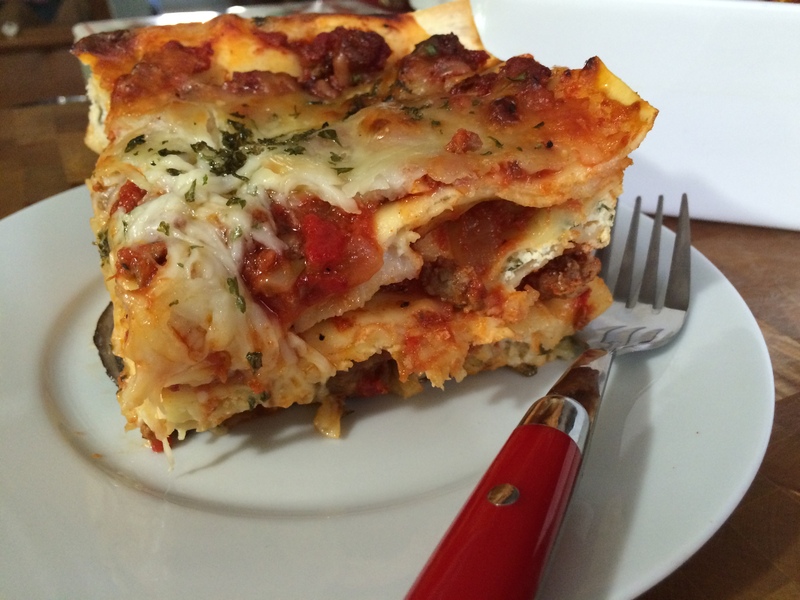 Do I dare to say that we all love Homemade Lasagna? I’m going to say YES. This recipe is going to utilize using leftover meat-filled tomato sauce. I don’t know about you, but whenever I make a pot of meat-filled tomato sauce, Sunday Gravy as my nana used to call it, I always make too much. I’ve either put the sauce in the frig, thinking to myself, I’m going to make something with this sauce tomorrow and just never get around to it. So often, life can get really busy and time can get away from us. Not anymore! Making two meals from the same meat-filled tomato sauce does take some planning but, having the sauce ready makes pulling together a Homemade Lasagna much easier. I don’t ever have to think about how I’m going to use my leftover meat sauce anymore. I’m just going to make my Homemade Lasagna. Once you make the lasagna, you can freeze single-serving portions in a freezer-safe storage container or freeze the entire pan. If you decide to freeze your lasagna, cover the entire lasagna, baking dish included (most ceramic dishes are freezer and baking safe), tightly with several layers plastic wrap making sure there are no gaps where air could get in and cause freezer burn. This way it will keep as fresh as possible until your ready to bake. When making lasagna, because there are so many components to the dish it can seem daunting. Just by eliminating, having to make, one of the ingredients makes this dish so much easier. The link for Meat-Filled Tomato Sauce is at the bottom of this post. I’m using Grana Padano cheese for this recipe. It’s very similar to Parmigiano-Reggiano in flavor and texture but not quite as expensive. The cheeses come from two different regions of Italy which, without getting down into the weeds, basically means there’s a difference in the grass the cows eat. There’s a great piece called Grana Padano v. Parmigiano-Reggiano at www.talkoftomatoes.com. helped me understand how and when I could substitute one cheese for the other. This style of lasagna sheets is my favorite. I like the flat thin pasta style for my lasagna. They’re much lighter in texture than the traditional lasagna sheets and they’re oven-ready. This is awesome, I’ve eliminated two steps while making this dish. Part 1. Leftover Meat-Filled Tomato Sauce. Click the link below, for my Baked Cavatappi recipe. Part 2. Sautéed Portobello Mushrooms. In a large sautépan on medium-high heat melt unsalted butter with olive oil. To the pan add the sliced Portobello mushrooms and dried thyme, stir and cook for 10 to 12 minutes until brown. Once the mushrooms have browned and released all their liquid add 1 teaspoon of Kosher salt and 1/2 teaspoon of fresh ground black pepper, stir to combine. Transfer the sautéed mushrooms to a bowl. Set aside. It’s time to move on to the next step. To make the Bechamel sauce, start with a large saucepot on medium heat, heat the milk to just under the boiling point. In a Dutch oven (or heavy bottom pot) melt unsalted butter. Add all-purpose flour whisking together until the flour and butter become smooth, blonde in color, and paste-like (this is what’s known as a *roux), 2 minutes. Add freshly grated nutmeg then slowly add the heated milk, continuously whisking. Add 1 tablespoon of Kosher salt and 1 teaspoon of fresh ground black pepper. Switch to a wooden spoon continuing to stir as the sauce thickens, coating the back of a spoon. Bring to a boil, then lower the heat, cook, stirring for 2 to 3 minutes more. Off the heat add the shredded Mozzarella, grated Grana Padano cheese, and 2 tablespoons of freshly chopped flat-leaf Italian parsley, stir to combine and set aside. In a large mixing bowl, add whole milk ricotta cheese, 1 beaten large egg, 1 tablespoon of fresh finely chopped Italian parsley, 1 teaspoon of Kosher salt, and 1/2 a teaspoon of black pepper. Mix together until combined. Set aside. Butter the bottom and sides of a 9 x 13 x 3 baking dish. Part 5. Assemble The Lasagna. Start with 2 ladles of meat-filled tomato sauce in the bottom of the baking sheet. Spread the sauce around evenly to cover the entire bottom of the baking dish. Place the lasagna sheets down over the sauce for the next layer. If the sheets don’t fit perfectly, it’s ok if you need to slightly overlap them so they fit the size of the baking dish. Refer to the pictures above. Next, ladle the Bechamel cheese sauce, Using a rubber spatula, evenly spread the cheese sauce over the lasagna sheets. Add the slice sautéed Portobello mushrooms on top, placing them so they’re evenly set throughout the layer. Lay another layer of lasagna sheets, then ladle the ricotta mixture on top. Use a rubber spatula to gently spread the ricotta mixture over the lasagna sheets. To the ricotta layer, evenly add 1/2 a cup of the Mozzarella cheese. Lay on the final layer of lasagna sheets. Ladle the remaining meat-filled tomato sauce spreading it evenly all over the top. Sprinkle remaining shredded Mozzarella and remaining Grana Padano cheese over the top. Dice the remaining butter into tiny pieces and *dot the top the lasagna. Tip: Spray the dull side of the aluminum foil with non-stick cooking spray. This will prevent the cheese from sticking to the foil. Bake covered for 45 to 50 minutes. Uncover and continue cooking until the cheese is melted, golden brown and bubbly, 5 to 7 minutes. Garnish the top with the remaining chopped parsley. Let rest for at least 20 minutes before slicing. This way it will have set. Preheat the oven to 375- degrees F.
When you’re ready to bake the lasagna start by defrosting it overnight in the refrigerator. If it’s still not completely thawed at that point, take it out of the frig, remove the plastic wrap. Allow the lasagna to sit out at room temperature for 30 minutes before baking. Bake for 40 to 45 minutes. Remove the foil and continue to bake for another 10 to 15 minutes until heated through and bubbly around the edges. *Roux: A roux is flour and fat (butter) cooked together and used to thicken sauces. *Dot: To scatter butter in bits over food.